carefully cropped out and no mention of it in the text either. If you try a Google search for Cala D'en Serra in Ibiza the majority of the results will wax lyrical about the wonderful little beach in a cove north of Portinatx (like this example) but they will fail to mention the most striking feature of all; the huge abandoned building site looming over the beach like the gigantic corpse of some concrete predator that had died waiting for the tourist cash that never came. I knew nothing about the place or it's history when I first ventured there on an exploration day in January 2011. We followed the signposts from the northern resort of Portinatx to Cala D'en Serra on a whim. When we arrived at the top of the cove the first thing my mate said was "bloody hell what's that?" I didn't know but I knew we'd have to go down and take a look. The hotel complex as seen from above. The cove is only accessible down a crumbling windy track so we left my car at the crest of the hill, fearing for it's already knackered track rods and suspension bushes and walked down to the cove, however many people choose to drive all the way down and park in the shade of the abandoned hotel. 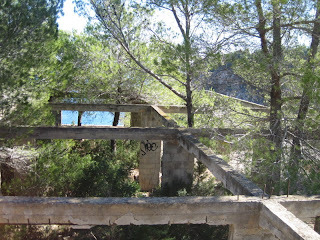 The half mile walk down to sea level provided some exceptional panoramic views over the bay and the abandoned hotel. Also around halfway down and off to the left are some impressive cliffs and traces of old stone buildings of some sort underneath the vegetation. Once we got down to hotel itself, it was in an even worse state than it appeared from above. "PROHIBIDO PELIGRO" (Danger keep out) was written in faded white paint on one wall near the site enterance. Clearly no deterrent given the amount of grafitti and vandalism on the site. We had the cove entirely to ourselves for the afternoon and spent our time taking photos, kicking a football about, relaxing on the beach and pitching rocks into the sea. When I got home I conducted some research and gathered that the hotel project was started in 1969 by acclaimed Catalan Architect Josep Lluís Sert who was exiled in the United States at the time. His clerk of works Antonio Ferran signed off on his projects back in Catalonia to get around the fact that Spain's fascist government ensured that Sert himself could not be accredited as an architect in the Catalonia & Balearic islands region. After a lot of work had already been completed the project was put on hold in the mid 1970s and abandoned completely after Sert died of lung cancer in 1983.
of the abandoned hotel structure. Since Sert's death there have been many proposals and debates over what to do with his half finished project. Many people consider the half constructed hotel a blight on an area of outstanding natural beauty while others see the project as an important piece of cultural heritage given that Sert was one of Catalonia's most acclaimed architects (a list of his projects can be seen here). In the early 2000s plans were drawn up to complete the complex in the style intended by Sert for use as an exclusive tourist attraction and Thalassotherapy centre. These ambitious plans were eventually abandoned in the wake of the banking crisis and the subsequent downturn in the island tourist economy. The site is now heavily overgrown with large trees growing through many of the structures. In other places it has been badly damaged by generations of vandals and by the passage of time. Several partition walls have been smashed through completely and parts of the superstructure have also been deliberately damaged. Exposure to the elements over time has caused much of the reinforced concrete to start splitting as the steel fibres within expand with rust causing the concrete to flake away. One of the best preserved parts of the site is the terrace overlooking the bay which provides a phenomenal panoramic view of the cove and an interesting elevated view of the the small beach below. Even though the terrace is in relatively good condition, immediately behind it there is an abandoned swimming pool full of rubbish, rubble and a few inches of slimy green water at the deep end. in the cove unrelated to the hotel complex. The beach itself is relatively unaffected by the presence of the hotel and is a particularly picturesque location outside the summer tourist season, when, with luck visitors can have the beach entirely themselves. In the winter months the shallow waters of the bay remain fairly warm (warmer than the North Sea is at the height of summer). A wetsuit would be recommended for anyone not of the "hardy northern European type" intent on swimming there in the winter or early springtime. For photographers there are some traditional Mediterranean boat sheds by the beach, a small beach garden, cliffs and beautiful turquoise waters. It is also possible to capture the striking contrast between the natural beauty of the beach and the decaying hulk of hotel above it. The hotel complex is an excellent modern ruin for urbex photography, however be warned it is very unsafe for anyone without a basic knowledge of structural engineering to enter some parts of the site as several of the rooves and walkways have become structurally unsound. presumably been shoved down this hole to prevent tourists from falling down it. I like your place because you have a very nice place. And I'm sure I can have fun and relax here. I will encourage my family to come here. Thank you so much for letting us knows this one. Anyway, check our other latest hotel ibiza here. The vehicle was placed there to block the exit of the zombies trapped in the basement, its all we could do at the time. Clearly more efforts need to be taken to insure the ongoing safety of this area> We simply did not have the manpower or resources to continue or work, so we started drinking and simply hope for the best.